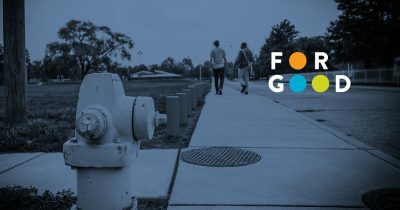 In this special episode of For Good, Diane Schussel talks about family stabilization—one of five of CICF’s leadership initiatives for Marion County—and how it is impacting our community. This episode is part of a special series introducing CICF’s strategic plan for Marion County. Listen to the other four episodes to learn more about how CICF is working to help create a more equitable Central Indiana. DIANE: Hi, I’m Diane Schussel, senior community leadership officer at Central Indiana Community Foundation. CICF has a mission to mobilize people, ideas, and investment to make this a community where everyone has equitable opportunity to reach their full potential, no matter place, race, or identity. And we have five initiatives that will help us execute that mission in Marion County. One initiative is family stabilization. Essentially, we’re looking for equitable opportunities for everyone to obtain housing, transportation, and health services. So my focus is broadly housing, we’re looking at access to housing around transit opportunities as Marion County and especially downtown starts to get a fuller array of transit opportunities. We want to make sure that there’s access to affordable housing for everyone located near transit. We’ve seen in other cities. as transit gets developed that a lot of that becomes highly marketable property, especially near the transit stops, and we just want to make sure that we don’t leave some people behind or displace people. So we have an opportunity to be proactive and get out ahead of things. So if you look at a lot of cities who have had transit for a while, there’s an affordable housing crisis. And you can see downtown that higher-end apartments and condos have become more and more the norm and there’s more and more being developed. So this is a moment that we feel like we can intervene before it gets to be a crisis. We tend to think of Indianapolis as being an affordable city—and for owner occupied units—that seems to be more true than for renters. So, for example, we have a statistic that we call the housing cost burden. And that is if you pay over 30% of your income in housing costs, whether it be rent or mortgage payment, you’re said to be cost burdened. In Marion County, it looks like we have about 50% of renters who are paying more than 30% of their income for housing costs. So, that’s an issue already and if you add on the cost of transportation, it’s a pretty significant percentage of your budget so that doesn’t allow you money to pay for a lot of other things like healthy food you know, sort of things for your children. The idea is that if we can increase access to quality transportation options, there might not be such a burden on the transportation side, right? So that, number one, if we can create affordable housing opportunities so that people aren’t spending over 30% of their income on housing, and then if there’s opportunity to access transportation so that maybe you only need one car for your family, or maybe you need no cars depending on where you work. That just cuts down on those transportation costs and frees up money to pay for other things that enable you to live a healthy life. And I do want to point out although we think of Indianapolis as being so heavily owner, owner oriented, recent statistics show that in Marion County, 45.8% of housing units are actually renter occupied. We do have a pretty significant renter population here. And then a really interesting statistic that I just learned here is that in Marion County, actually, almost 10% of households have no vehicle available. There’s another significant impediment to family stability. Well, I think that where you live can impact so many other things in your life, right? I mean, number one, if you have kids and they move a lot, they’re moving schools a lot which can be detrimental to education. Where you live determines in many cases where you go to school. It determines your access to transit. It determines your access to employment, which determines your access to grocery options and so many other things. Where you live can be critical to your success to your family’s stability. It also can affect—because of public safety—can affect your health, both your physical health and your mental health. Another focus area for CICF is trying to improve our system for dealing with homelessness so that if somebody does find themselves in a situation where they’re homeless, it’s very brief. First of all, it’s rare, and secondly, it’s a very brief occurrence. We are working with partners in the city and then a lot of service providers and housing providers in the city to try to create a system where we can address homelessness more effectively. Creating more units and then providing services so that people can stay in their units and be successfully housed. I think one other statistic that we should be aware of when we think about homelessness is our high eviction rate. So in Indianapolis, the most recent statistics that I have are for 2016. We had 11,570 evictions in Indianapolis, which if you break that down to days, that would be 31.7 households evicted per day. So when you think about that, you think about the lack of stability of housing, which plays into both the affordable housing issue and the homelessness issue that we’ve talked about. So it just really brings to me to the fore why this is a crisis and something we need to address. And then, again, it does burden African American and people of color disproportionately. Well, I’m excited to make some positive changes in how we think about housing in Indianapolis. I think if we can partner high quality, affordable housing near transit, I think that’s going to be just such a win-win for this community to get people engaged, to make the transit accessible to everyone in the community. And that’s what brings me to work every day—the fact that I feel like we can make a positive change for people in how they live their lives.